The Calcutta High Court on Thursday revoked West Bengal Chief Minister Mamata Banerjee's order of immersion of Durga idols. The HC allowed immersion till 12am on all days, including Moharram. The court asked the police to ensure routes are designated for puja procession and tazia. The bench also directed the state government to put out advertisements giving information about the routes and also for ensuring amity and harmony between the communities. The Calcutta High Court asked the state government to chalk out designated routes for immersion and ‘Tazia’ processions. 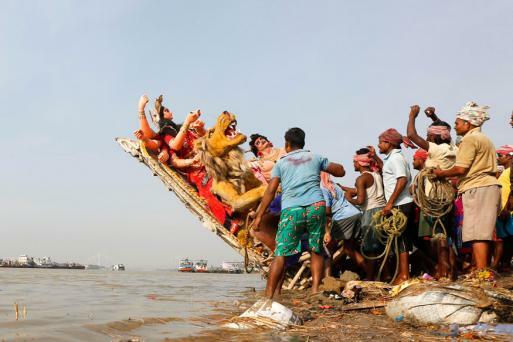 It said that immersion of Durga idols would be held on all days from Vijayadashami on September 30 according to the Hindu almanac, including that on Muharram on October one when such processions were prohibited by the state administration. The bench also directed the state government to put out advertisements giving information about the routes and also for ensuring amity and harmony between the communities. It declined a plea of the Trinamool Congress government for a stay on the order. The fight over religious rights is bound to spill onto the political pitch now and the High Court judgment has come as a massive setback to the Mamata Banerjee government, which had earlier issued an order asking Durga Puja organizers to complete the immersion ceremony by 6 pm on September 30. BJP too welcomed the Calcutta High Court's verdict on Durga Puja idol immersion. “Mamata government is doing vote bank politics in Bengal. This is the reason she banned immersion on Muharram day. But it is unfortunate that people in Bengal always have to rely on the judiciary to get justice,” said Sayanta Basu, BJP State Secretary. “There are people who are giving lectures on Bengal despite knowing nothing about Bengal and its culture. I feel angry whenever I hear such lectures...We will not listen to their lectures. They don’t believe in Manav Dharma. They only believe in agencies (CBI) to harass people. I will not let these people malign our Bengal,” she said. “No need to worry. We will make necessary arrangements to ensure peace during Durga Puja and Muharram," said Mamata on the court order. The Calcutta High Court asked the state government to chalk out designated routes for immersion and ‘Tazia’ processions. It said that immersion of Durga idols would be held on all days from Vijayadashami on September 30 according to the Hindu almanac, including that on Muharram on October one when such processions were prohibited by the state administration. The issue over Muharram and Durga Puja was purposely created by Mamata Government… This is nothing but vote bank politics… The government tried to create a division between two communities… The ban on idol immersion on Muharram was not required... the government could have avoided that… people lost trust on Mamata and therefore they knocked the doors of judiciary… in Bengal, Hindu and Muslim together celebrate festivals… then why is Mamata creating this issue… she needs to answer this,” says Congress Adhir Chowdhury. “Today’s verdict of Calcutta High Court proved that Hindus will knock the door of the judiciary for justice every time… We have never seen such appeasement politics ever in Bengal. People in Bengal have lost hope on state government,” says RSS General Secretary, South Bengal, Jishnu Basu. "Situation in Bengal is precarious... it is unfortunate that people have to look for judiciary for justice or to celebrate puja... it is a total failure of governance under Mamata Banerjee rule in Bengal. This is very unfortunate that we have to approach judiciary for our religious rights. Such situations were not there during left rule. During left rule people used to follow immersion and Muharram on the same day... Why is the Mamata government doing divisive politics? We wholeheartedly welcome court's order,” says CPIM’s Sujan Chakraborty. 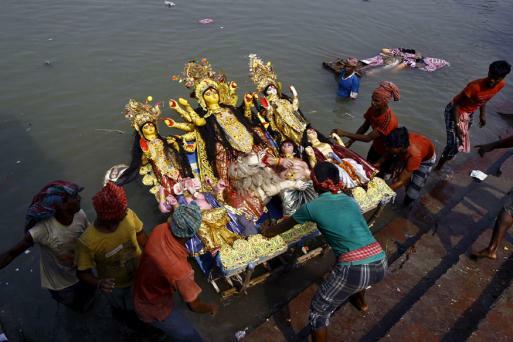 Idol immersion in West Bengal has been permitted on all days. The High Court has revoked Mamata Banerjee's order and instructed separate routes for Muharram, Durga Puja idol immersions. The state administration has been asked to make necessary arrangements. "You can exercise the power conferred to you. But, We cannot permit arbitrary use of power. You have to go step by step. If a gathering got violent, first you will use water cannon, then mild lathi-charge and then the next step. You can't fire first. Prohibition means that you are taking last step first. You are so powerful. Can you stop the calendar, can you regulate the moon? If you can, just do it," says Acting CJ. The advocate general replies with, "After passing the judgment if we again bar the emersion, what will happen?" "There is a difference between regulation and prohibition. You are exercising extreme power without any basis. Just because you are the state, you think you can pass an arbitrary order? Only because you dreamt that something will go wrong, you cannot impose restrictions," acting Chief Justice of Calcutta High Court tells West Bengal state government. The bench had said that a mere assumption that a law-and-order situation might arise, owing to Vijaya Dashami and Muharram falling one after the other, could not be the basis for imposing curbs on immersion timings. Observing that Chief Minister Mamata Banerjee had herself told a public meeting that Hindus and Muslims lived together in harmony in the state, the bench said, "Listen to what the head of the state says and not a police officer." RECAP | The Calcutta High Court had on Wednesday questioning the West Bengal government's curbs on Durga idol immersion, saying State cannot hinder a citizen's right to practise religion on the basis of a mere assumption of law and order disruption and must provide sound reasons for doing so. "Let them (Hindus and Muslims) live in harmony, do not create a line between them," Acting Chief Justice Rakesh Tiwary had said, asking the government to provide a "concrete ground" for its decision. The Calcutta High Court is scheduled to pass today its order on three PILs challenging the restrictions on immersion of Durga idols at the end of the five-day Durga Puja festival in West Bengal. The Mamata Banerjee government in the state had imposed restrictions on Durga idol immersions on September 30, Vijaya Dashami, after 10 pm as Muharram falls on the next day, October 1.